My Day-Glo Nordic Christmas Stocking is one of those projects that started out as one thing and morphed into something else. I’m happy it did, though. And I’ve got a tutorial below showing how to make it. For the #FabulouslyFestive promotion from Jo-Ann, my plan was to a simple faux sherpa fleece stocking with a fold down cuff. I had the pattern drawn out and everything. But then when I went to my Jo-Ann store to buy the fabric, they hold sold out of the faux sherpa fleece I wanted to use. Because of course, sherpa fleece trending right now means that loads of other people were also wanting to use Sherpa fleece in their sewing projects. So while I was considering whether to check another Jo-Ann location for the fabric I wanted, my eyes drifted over to the next aisle. And I see turquoise Cuddle fabric. And I think to myself, if only they made turquoise faux sherpa fabric. And then I look a little further down the aisle, and I see the flannel brights. If only they made turquoise faux Sherpa fabric with bright lavender flannel backing. Or coral. Or lime green. Or any of those gloriously happy flannel prints on the other side of the aisle. And hey, how cool is this lavender and rose graphic print? I wonder if I could fuse the flannel to the back of the Cuddle and make my own faux sherpa? Kind of a faux faux sherpa? And that’s when my tasteful faux sherpa stocking took a decidedly day-glo turn. I grabbed up my fabrics and skipped over to the trims aisle where I couldn’t decide between a peachy pom pom trim or a neon yellow cut-out trim. And when I got home, I discovered that yes, you can fuse Cuddle fabric to flannel. Just use a low setting on your iron and make sure the Cuddle doesn’t come in contact with the metal plate. And when it’s fused, the Cuddle fabric becomes waaaay more manageable because the flannel gives it stability and keeps it from stretching. 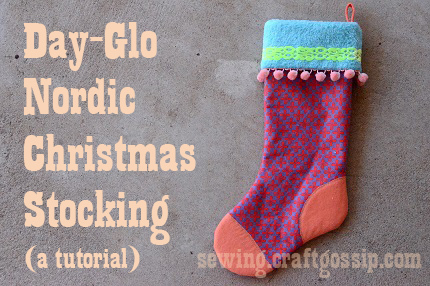 And it turns out that my Day-Glo Nordic Christmas Stocking is actually very similar to my original design, just with brighter colors and pretty trim. It’s totally a crazy design, but I love it! — 5” ribbon for the hanging loop. I used a scrap of the same fabric as the heel and toe, turning the raw edges in and stitching them down. 1. Cut two pieces each of the main fabric and Cuddle fabric big enough to cut the stocking pattern from. 21″ x 10″ will be slightly larger than the pattern, giving you a little wiggle room. 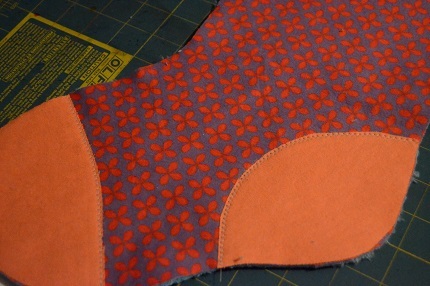 Fuse the main fabric pieces to the Cuddle fabric pieces, wrong sides facing, to make two double sided pieces of fabric. Pay attention to the direction of the pile of the Cuddle fabric and the direction (if any) of the print on your main fabric. Cuddle fabric is a synthetic, but you can still fuse it if you use a lower setting on your iron and a pressing cloth. I took these photos at night. Pardon the weird lighting! The sick-looking blue is actually a beautiful turquoise. 2. 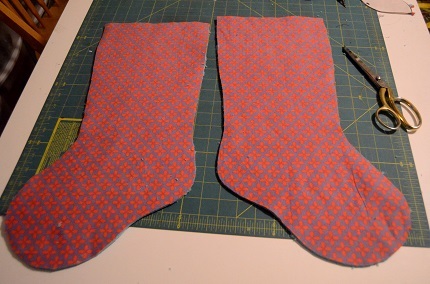 Cut two stocking pieces from the fused fabric. Make sure they’re mirror images of each other. 3. 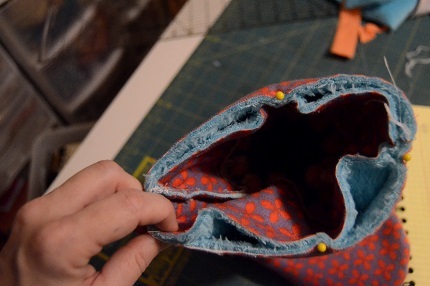 Cut the heel and toe pieces out of a scrap of fabric and stitch them down to the stocking. I just left the edges raw and zig zagged them down. 4. Place the stocking pieces right sides together. (Cuddle sides will be facing out.) Serge or sew with a ½” seam allowance, leaving the top open. If you’re using a sewing machine for this step, go back and zig zag the edges of the seam allowance together. 5. Turn the stocking right side out. You may need to press it with your iron to shape it. See that junk at the top of the photo? That’s all the mess I pushed back in order to make room to take the photo. Here’s a pull-away. 7. 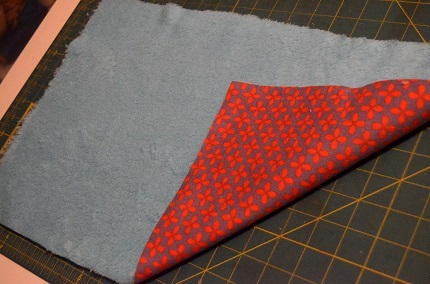 Cut a 5” x 17” piece of main fabric and Cuddle fabric and fuse them together. Trim down to 4” x 16”. This will become the cuff. If you want to add trim to the cuff, now is the time to do it. 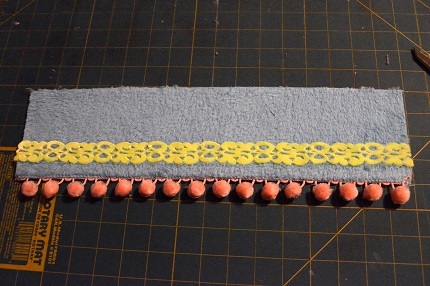 I stitched pom pom trim to the underside of the cuff with a narrow zig zag stitch. The neon cut-out trim that I used was going to be impossible to stitch down and have it look good, so I just fused it down to the fur. 8. 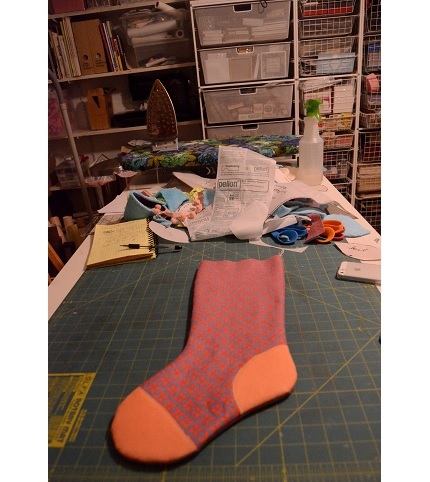 Fold the cuff in half (4″ sides touching) and sew the side seam with a ½” seam allowance. Serge or zig zag the seam allowance. 9. 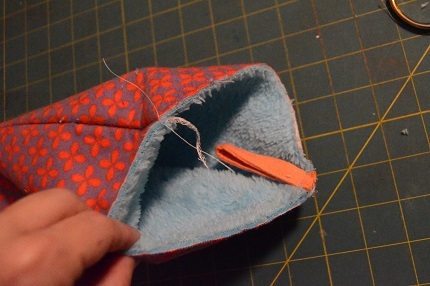 Place the cuff inside the stocking with Cuddle fabric sides facing. Pin it at quarters and stitch around the top with a ½” seam allowance. 10. 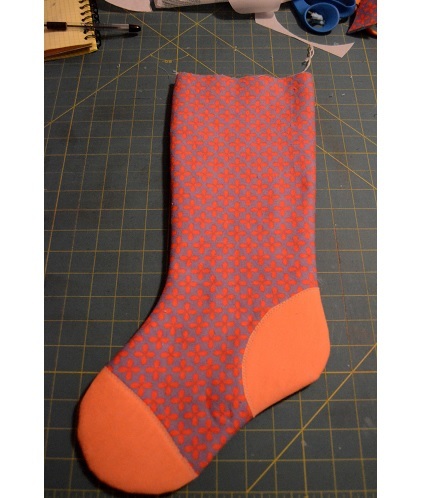 Flip cuff to the outside of the stocking, covering the raw edge. For more holiday crafting inspiration, check out Jo-Ann’s Celebrate The Season holiday crafting page or search Google, Pinterest, Instagram, or other social media for #FabulouslyFestive. 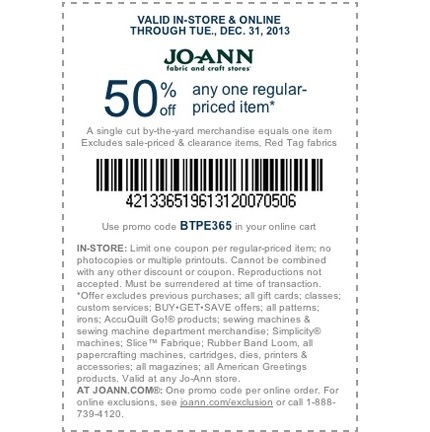 And, whether you’re making a crazy bright stocking like the one I made, or some other fabulous Chrimas project, use this coupon to get 50% off one regular priced item. Happy crafting!! Editor’s Note: This coupon has expired.